Ethiopia’s titular prime minister warns western governments that his security forces will stop protecting their embassies unless the favor is reciprocated by them. 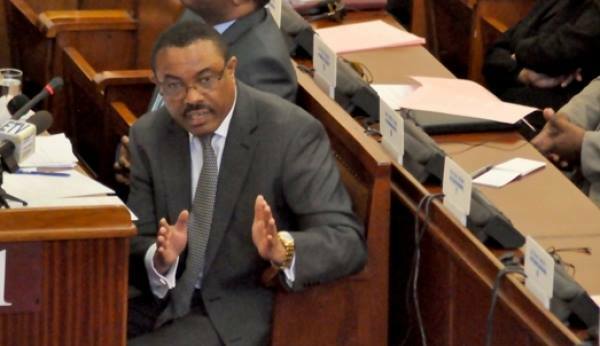 Speaking to the parliament on Monday, where he also announced a reshuffled cabinet, Hailemariam Desalegn called on western governments to protect Ethiopian Embassies from activists and Ethiopians in the Diaspora who have been venting their angers and holding their embassies in protest for the killings and atrocities committed by the regime. Speaking about Egypt, one of the countries the Ethiopian regime routinely accuses of fomenting the uprising in the country, Desalegn said some institutions in Egypt were found to have a hand in the unrest in his country. The Ethiopian regime customarily blames neighboring Egypt and Eritrea for all the ills in the country. Egyptian president Abdul Fattha Al Sisi last month denied his country had any hand in the uprising in Ethiopia. Similarly, Eritrean officials has said accusations by the regime in Ethiopia is a futile exercise of externalizing its internal crises. A year long protest has shaken the regime to the core and is making superficial changes to calm the widespread protests. Desalegn on Monday announced a new cabinet appointing new ministers but protesters are demanding removal of the regime, which is dominated and run by a minority Tigrayan oligarchy accused of dominating the politics and economy of the country.